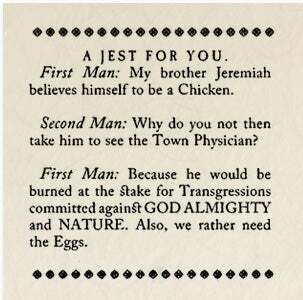 First Man: My brother Jeremiah believes himself to be a Chicken. Second Man: Why do you not then take him to see the Town Physician? First Man: Because he would be burned at the stake for Transgressions committed against GOD ALMIGHTY and NATURE. Also, we rather need the Eggs.